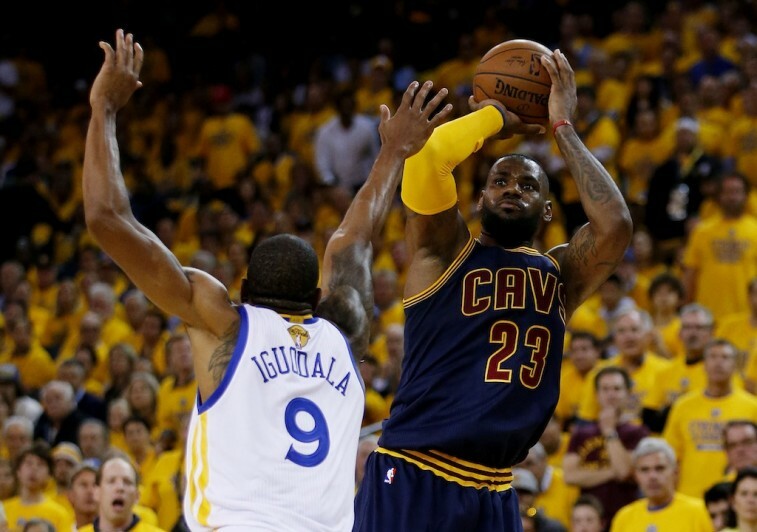 LeBron James has been everything for the Cleveland Cavaliers during these 2015 NBA Playoffs. Anyone who thought the King would be helped by the youth movement on this team, never predicted the adversity this group would soon have to overcome. Kevin Love has been out of contention since the Boston Celtics series. Kyrie Irving has flashes of greatness, but has pretty much been a shell of himself on account of a bum left knee. The supporting cast has been surprisingly helpful on multiple occasions, with players like J.R. Smith, Matthew Dellavedova, and Tristan Thompson seizing the moment. But really, it’s been all about James. And the numbers reflect that. In 15 playoff games so far, ‘Bron is averaging 28.7 points, 10.3 rebounds, and 8.1 assists per game. He has done everything he possibly can do keep the Cleveland Cavaliers afloat. If James doesn’t play like an extraterrestrial, the Cavs are most certainly watching the NBA Finals from the comfort of their own living rooms. And yet, even with all his otherworldly play, there is one area where James can’t seem to find success: His three-point shooting. According to ESPN Stats & Info, prior to the NBA Finals, James’ 17.6% shooting from behind the arc is the worst three-point shooting percentage by an individual – with a minimum of 60 attempts – in a single postseason in NBA history. We guess the King’s not great at everything after all. The good news for Cleveland’s No. 23 was, following his epic 44-point performance – that saw him shoot 2 for 8 from three – in Game 1 on Thursday, that number did increase to 18.4%. Unfortunately, even this superhuman performance couldn’t keep the Cavs from losing to the Golden State Warriors 108-100. James and the Cavaliers scraped out a victory Sunday night to even the series, but there’s still a lot of basketball to be played. Which means there’s still time for the King to get out of this postseason three-point shooting funk (he did shoot 3-6 from deep last night, so it’s possible he already has). There are some former players, however, who aren’t fortunate enough to have that same opportunity. With that in mind, here are the 3 worst three-point showings in NBA postseason history. In a different era – when three-point shots weren’t as prevalent as they are today – even the best of the best sometimes had difficulty knocking them down from the outside. During the Chicago Bulls’ 1997 NBA Championship run, this scenario happened to none other than Michael Jordan. His Airness shot a lousy 19.4% from beyond the arc during the 1997 playoffs. 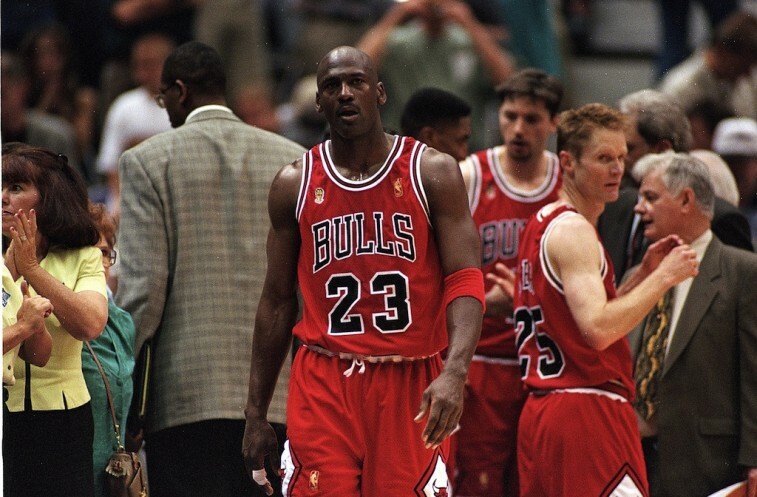 In a postseason that saw the Bulls lose just four games in all, MJ hit only 13 of his 67 three-point attempts. Of course, when the rest of your stat line for the entire postseason reads 31.1 points, 7.9 rebounds, 4.8 assists, and 1.6 steals per game, no one is really going to mind that you can’t knock down the three ball. Jordan’s 1997 postseason didn’t provide any “shrug” moments, but it still ended in a victory parade. That’s just how the greatest of all time did it. With a regular-season record of 72-10, you’ll be hard-pressed to find many people who wouldn’t consider the 1995-96 Chicago Bulls the greatest team NBA history. This group stormed into the 1996 postseason and looked to wreak havoc on any opponent that stood in it’s way. And you better believe that’s what happened. Chicago swept the Miami Heat in the first round, knocked out the New York Knicks in the conference semis in five games, took the brooms to the Orlando Magic in the Eastern Conference Finals, and rocked the West’s best Seattle SuperSonics in the NBA Finals in six games. In all the success, if you’re looking to find a single flaw during this team’s march to greatness, you can pinpoint Toni Kukoc‘s abysmal three-point shooting. The 6-foot-10 small forward put up 68 threes during the 1996 playoffs. Unfortunately, he only connected on 13, making him just 19.1% from three-point range. 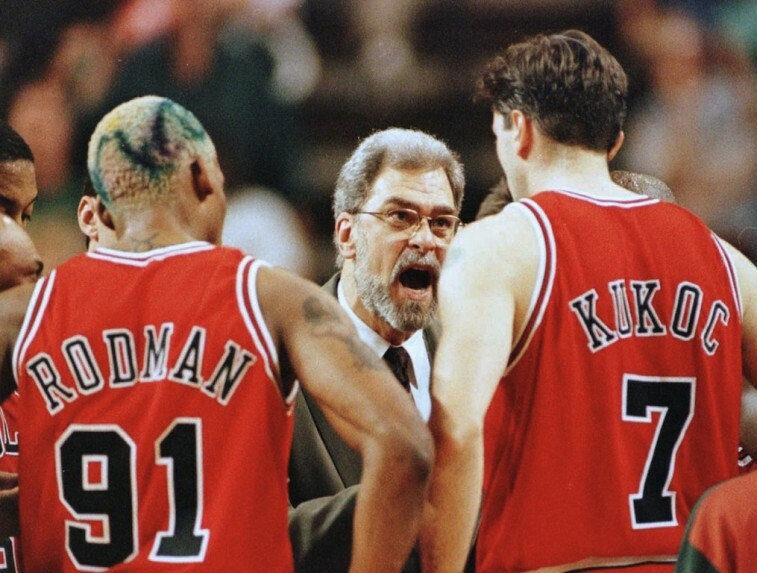 We’re not saying that’s why legendary coach Phil Jackson is yelling at Kukoc in the above picture. But, given his complicated relationship with the three ball, it’s not out of the question. The 2001-02 New Jersey Nets were a formidable team that ended up making it all the way to the 2002 NBA Finals. Prior to the club’s dance on the biggest stage, the Nets had to topple some tougher Eastern Conference foes than you might expect. New Jersey eliminated the Indiana Pacers in the first round, the Charlotte Hornets in the semis, and the Antoine Walker-era Celtics in the Conference Finals. It was an impressive run that set New Jersey up for showdown with the Los Angeles Lakers, with the Larry O’Brien trophy on the line. Of course, that’s where it all came to a miserable end. The Lakers took it to the Nets, dismantling the Eastern Conference champs in four games. 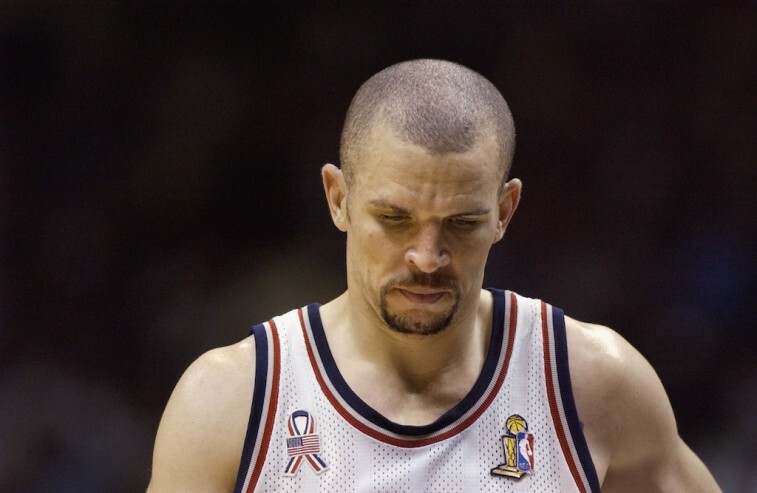 And while 2002 postseason didn’t have a fairytale ending for the New Jersey Nets, getting swept in The Finals was still a better showing than point guard Jason Kidd had from behind the three-point line. If you ask us, it really is a shame. Kidd had a steller postseason. He averaged 19.6 points, 8.2 rebounds, 9.1 assists, and 1.7 steals per game. But he was ice cold from the outside. Kidd took 90 threes during the 2002 playoffs, and he only made 17 of them. By shooting 18.9% from beyond the arc, Kidd still holds the mark for the worst three-point showing in NBA postseason history. Just think, if James keeps up his poor outside shooting, he could very well find himself the King of another historical mark. Although, we suppose it could always be worse. All statistics are courtesy of Basketball-Reference.com and ESPN Stats & Information.